In the span of just four months, the small Oregon towns of North Powder and St. Paul have gone from relatively unacquainted rural communities separated by more than 300 miles to among the fiercest rivals in the state. 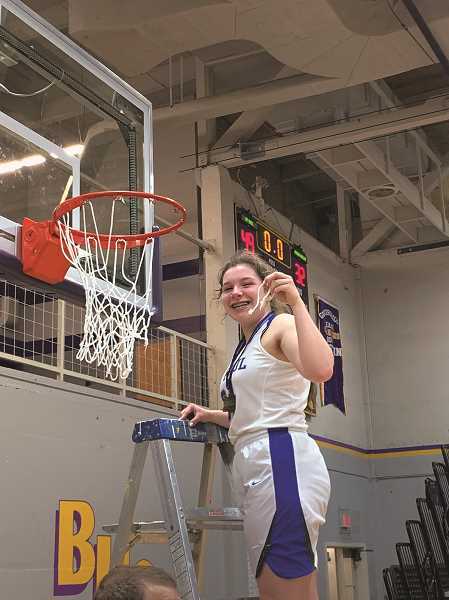 On Saturday, the St. Paul girls basketball team defeated the Powder Valley Badgers 49-32 in the 2019 1A Girls Basketball State Championship game, marking the second time in as many seasons that the two schools have clashed to determine which school has the best girls athletics program in the state this year. "That's the beauty of high school sports; it's our town versus your town," St. Paul head coach Dave Matlock said. "And it's probably as pure as ever at the 1A level. It's just little North Powder against little St. Paul." 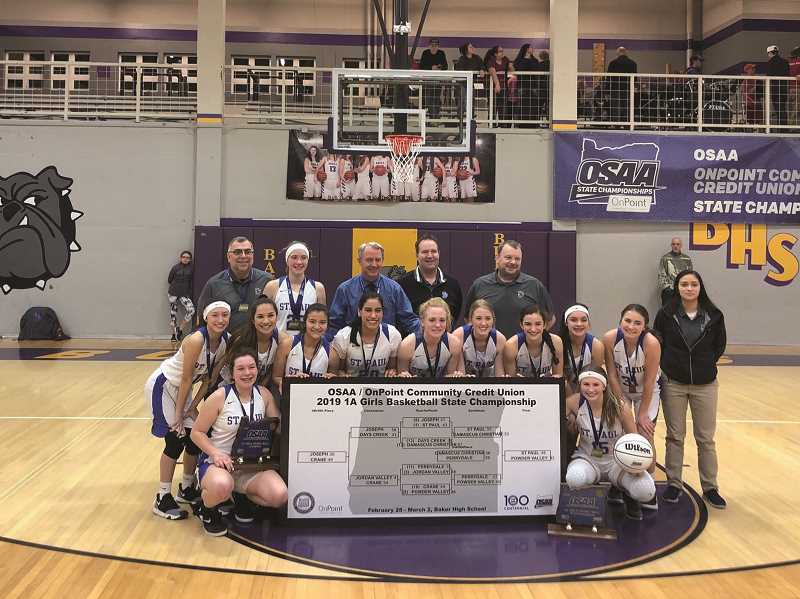 The title game, held at Baker City High School, bared a remarkably similar resemblance to the 2018 1A Volleyball State Championship, both in result and in the journey for each team. Both teams entered the contest ranked as the top two teams in the state. Both games began with a strong start by the Buckaroos that was matched by a surge from the Badgers, only for St. Paul to respond. And both times, the season ended with the Bucks sitting at a perfect 30-0 record, an accomplishment Matlock thinks will stand the test of time at St. Paul High School. "I don't believe you'll ever see that again, especially over 30 games," Matlock said. "It is virtually impossible for two different teams, even of high caliber, to be up every night and be able to execute every night, to never lose. It really is against human nature. We all have tough days, there's 100 million reasons that can take you down a notch on any given day." The victory gave the girls basketball program its fifth 1A state championship in school history, adding to title trophies earned in 1985, 1986, 1993 and 2007. In addition to championship losses in 1992, 2008 and 2012, the Bucks are now 5-3 in title matches. 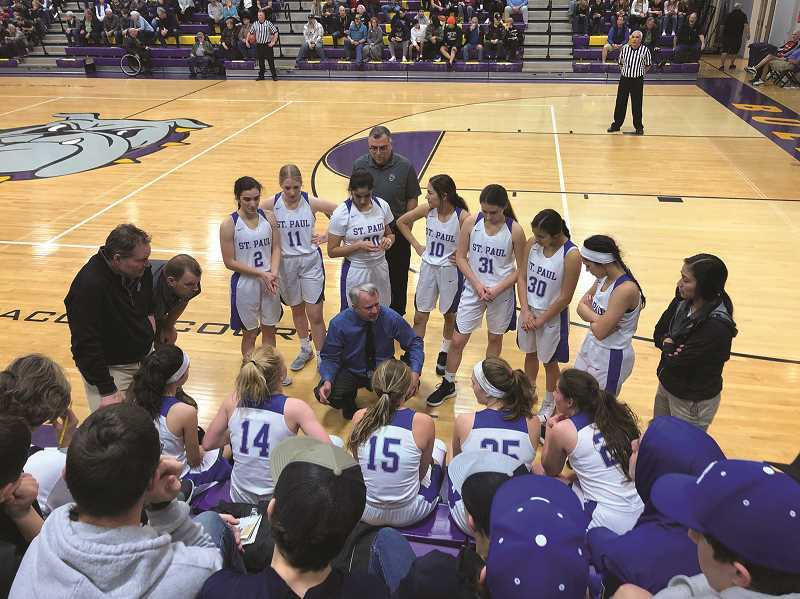 In Matlock's mind, this team stands alone — at least among the programs he has been a part of in his long history of coaching. Of the five championship teams in school history, this year's Bucks are the lone team to finish with a perfect record. But Matlock speaks of more than just the abject results — the unbeaten record that included a 55-33 win over Damascus Christian in the semifinal and a 42-37 victory over defending state champion Joseph in the quarterfinal. 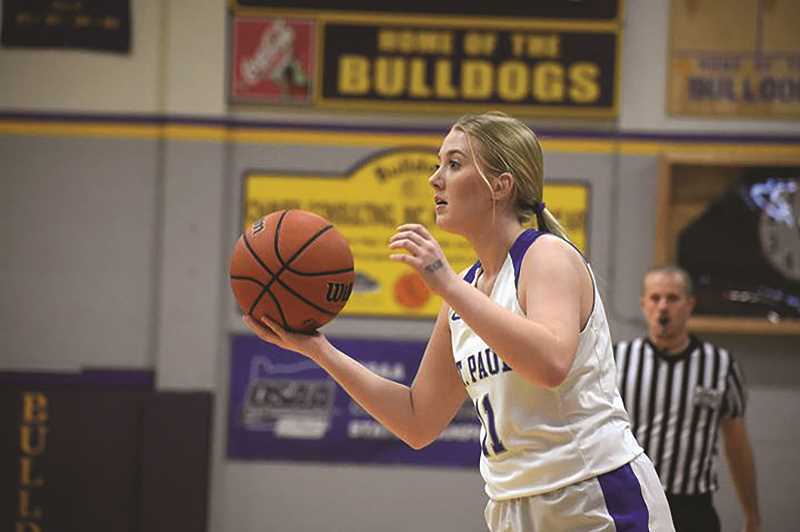 Indeed, the nature of this year's group of St. Paul girls wasn't to put stock in the results in the stat book, but to put stock in each other. "Their mentality for not watching the scoreboard and just getting after it to doing whatever they can do for their team on every given play — that is what really separates this group," Matlock said. In the championship game against Powder Valley, the Bucks jumped out to a 5-0 lead behind a pair of buckets from senior Emma Connor and Erin Counts, only to see the Badgers tie the game with three minutes left in the opening quarter. The two teams traded baskets for the remainder of the quarter, where St. Paul held a 9-8 advantage. But from that point on, the game belonged to the Buckaroos. St. Paul went on an 18-7 run in the second quarter and held the Badgers at a double-digit length for the remainder of the game. Despite losing the turnover battle 21-10, the Bucks made up for it by outrebounding the Badgers by 16 boards while shooting 43 percent from the field and 50 percent from 3-point range. Junior post Isabelle Wyss led the team with a double-double, notching 13 points and 10 rebounds, while Counts posted a game-high 14 points to go along with seven rebounds and four assists. Connor added 10 points and eight rebounds, but Matlock credited the team's bench players with stepping up — seven players notched at least one field goal in the title game. The Bucks' rebounding prowess was on hand all weekend. Counts 17 points, 17 rebounds; Wyss 14 points, 15 rebounds; and Connor two points, 13 rebounds; each reached double figures in boards against Damascus Christian the night before. Diana Hernandez added 13 points in the semifinal victory. In the tournament opener against Joseph, the Bucks held a 36-22 advantage. Connor led the team with nine points and 10 rebounds, while Wyss scored a team-high 13 points. Following the tournament, Matlock laid it out clear to his team. They were unique — a group he has never seen and may never see again. He wanted them to know that what they had done over the course of this season and the season before is simply unprecedented in his tenure. "This is the best group I have ever coached in 40 years," Matlock said. "When you add up our athleticism and our abilities, with our tenacity and our willingness to do everything we can on any possession, I've never had a finer team."